Syrphid flies are also known as flower or hover flies because they visit flowers to feed on nectar and pollen. The most common species in Pacific Northwest orchards is Scaeva pyrastri. Adults are not predaceous, but the larvae prey on aphids, scale insects and thrips. Syrphid fly larvae may quickly suppress aphid infestations, as each is capable of destroying hundreds of aphids during its development. Where lady beetles are not abundant, syrphid fly larvae usually become the dominant predator. Syrphid fly larvae can be important predators of the green peach aphid in Washington. They are effective in cooler conditions than most aphid predators and in the fall are the most effective predator of aphids on peach trees. 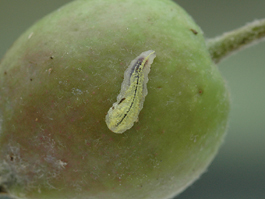 Syrphid fly larvae prey primarily on aphids of apples and stone fruit but also will attack other soft-bodied insects such as scales. Some species prey on thrips. The egg resembles a small grain of rice. 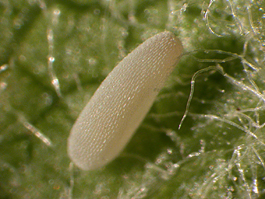 Eggs are laid singly on leaves, usually in or near an aphid colony. The larva is yellowish, legless and blind. It has a typical maggot shape, tapering to a point at the head end and broadly rounded at the rear. Its mouth has a triple-pointed dart with which it seizes and pierces its prey before sucking it dry. It has dark colored breathing tubes on the tail end. The adult superficially resembles a bee or wasp but has a more flattened body and, like other flies, only one pair of wings. It does not sting. It is usually yellow and black, and in some species the black parts have a greenish metallic sheen. It is 3/8 to 1/2 inch (10 to 12 mm) long. It is a fast and agile flyer, often hovering over plants. Although most syrphid flies overwinter as larvae in leaf litter, S. pyrastri overwinters as an adult. There are usually three generations per year in Washington, although in very warm years or areas there may be more. Adults need pollen from wild flowers or weeds in order to produce eggs. They move into the orchard relatively late in the season, usually about mid-May. Adults often hover around flowers where they feed on nectar and honeydew from aphids and scale insects. Females lay eggs on leaves near or in aphid colonies, where the young maggots will locate prey easily. Despite being blind and legless, the larvae move about and locate prey very efficiently. Often a larva will lift an aphid off the leaf surface while sucking out its body fluids. When mature, larvae go to the ground to transform into pupae and eventually to adult flies. The life cycle takes 2 to 4 weeks to complete. Adult syrphid flies are easy to see in flight but are often mistaken for wasps or bees. Syrphid flies have just one pair of wings, whereas wasps and bees have two, but it may be hard to distinguish them when the insect is at rest with the wings folded over the back. Black oily smears, the excrement of syrphid fly larvae, on plant foliage are typical signs of active syrphid fly populations. Larval densities can be determined in conjunction with visual counts of aphids. 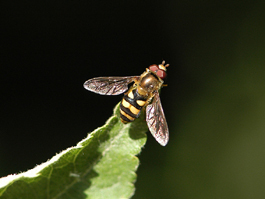 Syrphid flies are highly susceptible to insecticides. Avoid insecticidal control of aphid infestations if you see syrphid fly larvae in them.